In a pregame ceremony gone awry, the Mariners starting pitcher became a landing spot for a large feathered friend. MINNEAPOLIS — Well, he is nicknamed “Big Maple” and there is a commercial featuring him taking care of a nest of eggs in his hat. But on Thursday, it went a step further for James Paxton and the Mariners. During the Twins’ elaborate pregame ceremony for their home opener, which also included the U.S. gold medal curling team rolling out the first pitch, a bald eagle was supposed to fly across the field as the national anthem was being sung and a flag was unfurled in the outfield. It’s spectacle that is common for big sporting events. 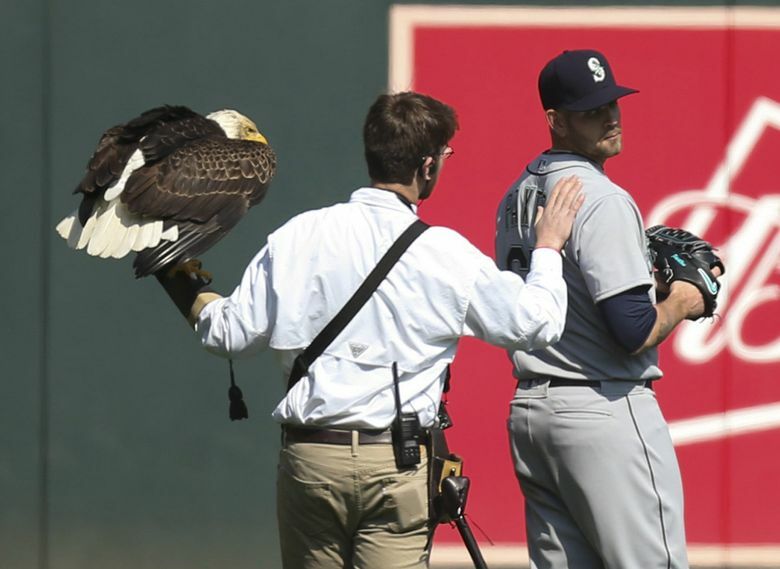 But this eagle decided that after flying across the field, he would stop not on his handler’s shoulder, but instead on the shoulder of Paxton, who had been warming up in the outfield with catcher David Freitas. Paxton, who was standing at attention with his hat on his heart, was stunned at first as the massive bird tried to land on his shoulder. The eagle’s first attempt was unsuccessful. But undeterred, the eagle finally managed to get near Paxton’s shoulder and back, latching its talons onto his jersey. For manager Scott Servais, he was just thankful Paxton didn’t get hurt. That would have been the topper to all the injuries the team has already endured — a disabled list stint because of a confrontation with a bald eagle. Paxton never lost his cool and didn’t panic. “I think Felix (Hernandez) would have probably ran away screaming,” Servais said. Running wasn’t an option for Paxton. The eagle’s handler came running over and finally took care of the situation. “He was just making sure I was okay,” Paxton said. No word if the eagle knew that Paxton hails from Canada and tried to prove a point. No word if Paxton still had the nest in his cap.